Good morning my beautiful and handsome readers, I hope you are all doing exceptional. Right now I’m so elated and ecstatic (lol, allow me use big grammar). 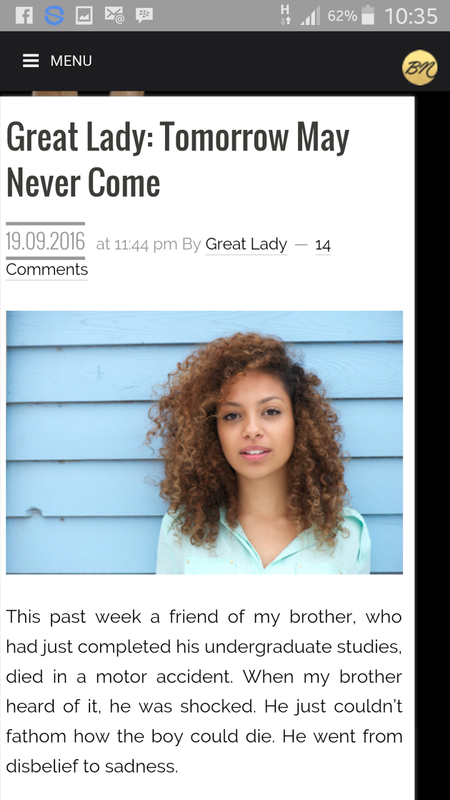 An article I wrote yesterday morning has being published on Bella Naija’s Website. It’s such an honour and a priviledge for me, BN is a site I visit every day, I’ve read thousands of articles there and never in my wildest imaginations did I ever know I would have an article on BN. So imagine my surprise when this morning I saw the article I wrote on the site. Honestly speaking my excitement knows no bound. So please kindly CLICK HERE to read the article. It’s titled Tomorrow May Never Come. Please when you do, don’t forget to comment and share. I love you all.